"Slot" redirects here. For information about the minigame from Super Mario Odyssey, see Slots. For other types of slot machines in the Mario series, see Slot Machine. 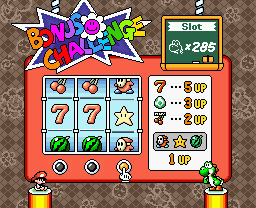 Slot Machine (or Slot in Yoshi's Island DS) is a Bonus Challenge in Super Mario World 2: Yoshi's Island, Yoshi's Island: Super Mario Advance 3 and Yoshi's Island DS. Players can win a certain amount of 1-Ups, depending on what they land on. If players do not have any of the possibilities below, they will get nothing and return to the map. This page was last edited on October 21, 2018, at 17:53.